A leading construction company based at Dubai requires Junior Electrical Engineers. About the Company : Originally established in 1985 and rebranded as Powermech Electromechanical Services LLC. (PMEs) in 2005, PMEs is now one of the leading MEP contractors specialized in providing complete turnkey solutions to the industrial and commercial sector. Having duly registered with Dubai Municipality, Dubai Electricity and Water Authority, Federal Electricity and Water Authority and JAFZA as a qualified service provider for various disciplines of Engineering Services delivery in all fields of our involvement. 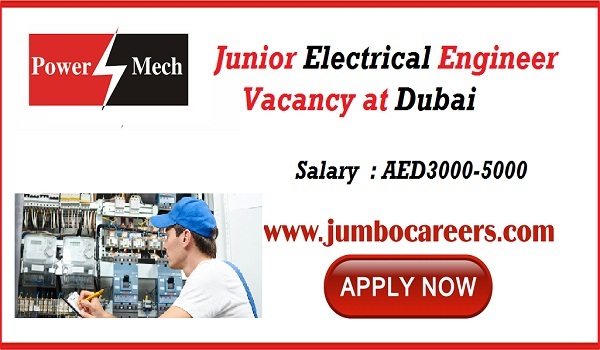 How to Apply for Junior Electrical Engineer jobs at Dubai? Powermech careers Dubai . If you are qualified as per the above requirements, please send your CV to info@powermechgroup.com mentioning “Jr. Electrical Engineer” as subject.